Delivering a whopping 380 ft. lbs. 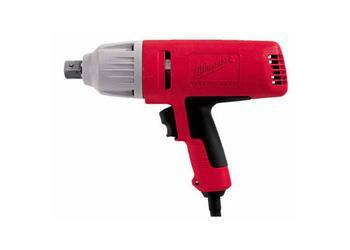 of torque and weighing only 6.2 pounds, this tool has a fantastic power to weight ratio. The 3/4 in. square anvil is more resistant to long term fatigue than a 1/2 in. anvil. The powerful 7.0 amp motor drives a unique impact mechanism at 1750 RPM (no load). This model features a friction ring and through hole socket retention, and a rocker switch for quick selection of forward or reverse. The ergonomically shaped handle with a soft cushioned grip provides a well-balanced and controllable feel to the tool. The special mechanism achieves desired installation torque faster and loosens rusted or fretted bolts in less time.